When you think of Sri Lanka, elephants, tea, and beaches might come to mind before Buddhist monuments. This South Asian island nation, just south of India, is home to nearly 6,000 elephants. It’s the world’s fourth-biggest tea producer. And it boasts more than 1,300 kilometres of beaches. Here are four magnificent monuments to see in Sri Lanka. If you’re a fan of 1980’s British New Wave rock bands, visiting Sigiriya is a must. Why? This stupendous granite monolith appears in Duran Duran’s Save A Prayer MTV video. However, unlike singer Simon Le Bon, you probably won’t want to wear a white linen suit when you climb up this 660-foot-tall rock fortress, a UNESCO World Heritage Site since 1982. 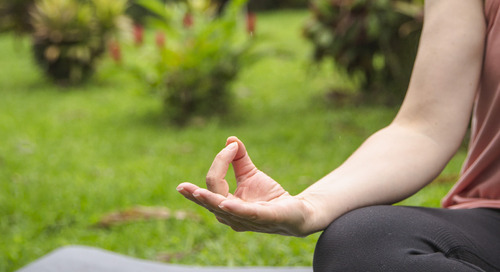 It’s about 1,200 steps to the Lion Rock summit, where you’ll enjoy a panoramic view of the terrace gardens, boulder gardens, and water gardens below, as well as the cloud-wreathed Knuckles Mountains. Explore the brick ruins of the palace of King Kashyapa I (473-495 CE), who built Sigiriya. The well-preserved frescoes of celestial nymphs you’ll see en route to the top also date to the Buddhist king’s reign. 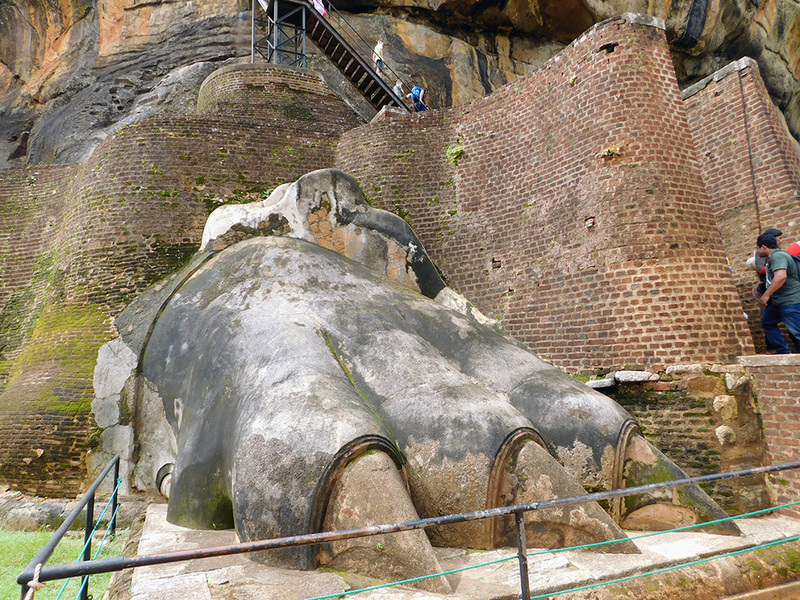 The north side of Sigiriya once featured a colossal stone lion. All that’s left are its paws, which still inspire awe today. 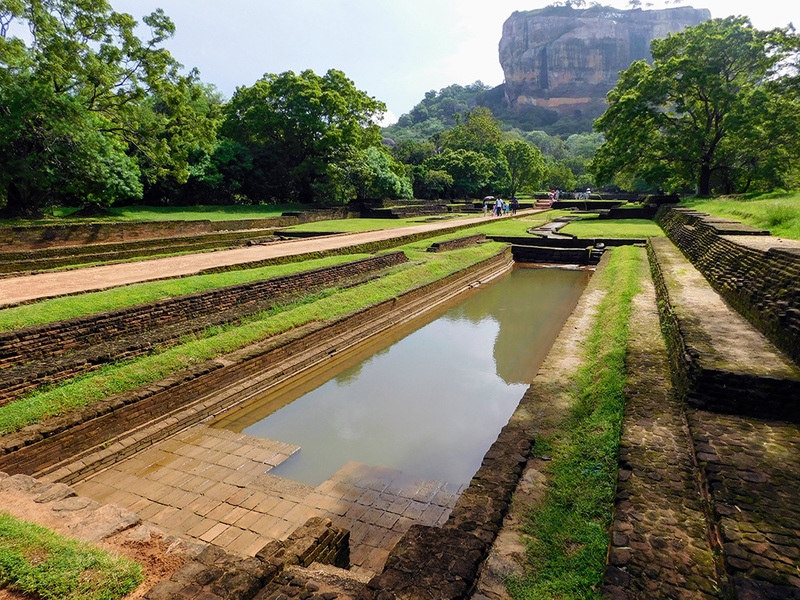 After Kashyapa’s death, Sigiriya functioned as a Buddhist monastery until the 14th century. Yet the stray dogs who abound on site aren’t particularly reverent. They sleep everywhere and anywhere, including on the narrow metal staircase teeming with visitors. Watch your step! 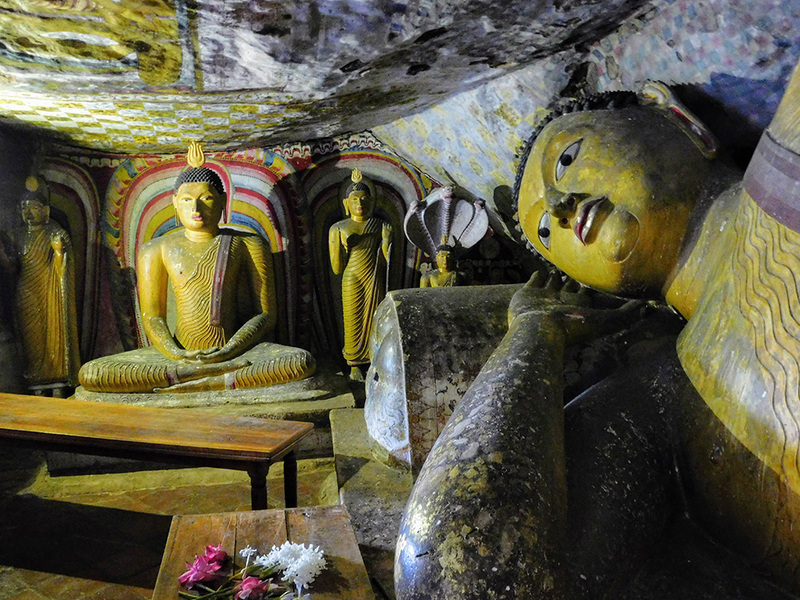 Just a half-hour drive from Sigiriya, the Dambulla Cave Temple offers a treasure trove of Buddhist artwork in its five caves, including 153 statues of the religion’s founder, sitting, standing, and reclining. 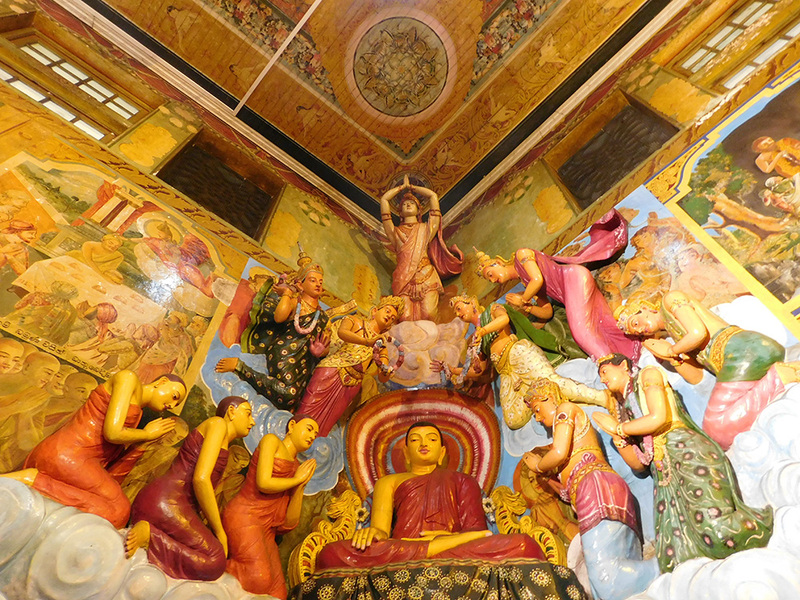 Renovated and redecorated at various points in the Anuradhapura (377 BC-1073 AD), Pollonaruwa (1073-1250), and Kandy (1469-1815) epochs, this venerated monastery also includes colourful murals of gods and demons. This UNESCO World Heritage Site, occupying a hilltop granite outcropping, is more than 2,000 years old. On the path up to the Dambulla Cave Temple, watch out for toque macaques. 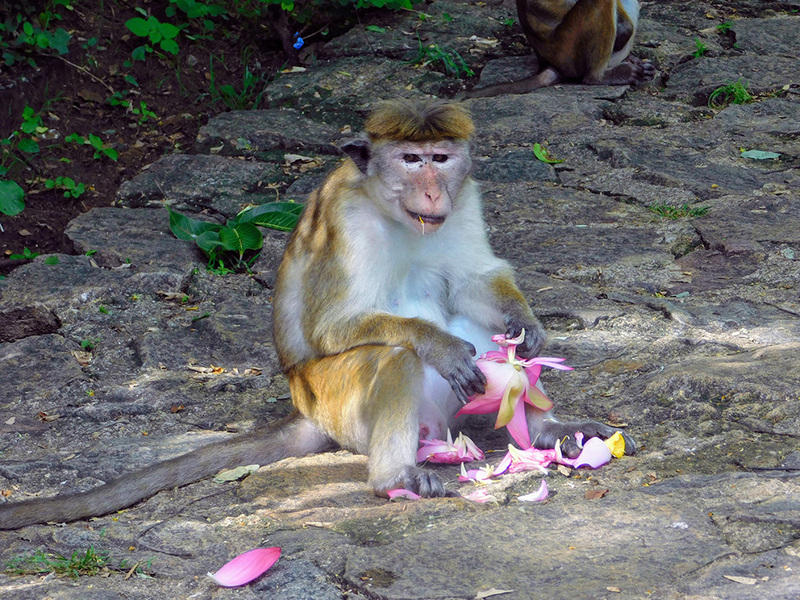 These lively monkeys, endemic to Sri Lanka, groom one another, nibble on flowers, and periodically dash off into the bushes. And on the way back down, the 2000-constructed Golden Temple, topped with a huge golden Buddha, provides an unmissable photo op. The atmosphere at the Gangaramaya Temple in Colombo, Sri Lanka’s largest city, is as serene as it is eclectic. Built in the 19th century near Beira Lake, it welcomes everyone from Sri Lankan politicians seeking the blessing of monks to barefooted Western visitors taking shelter from monsoon rains. 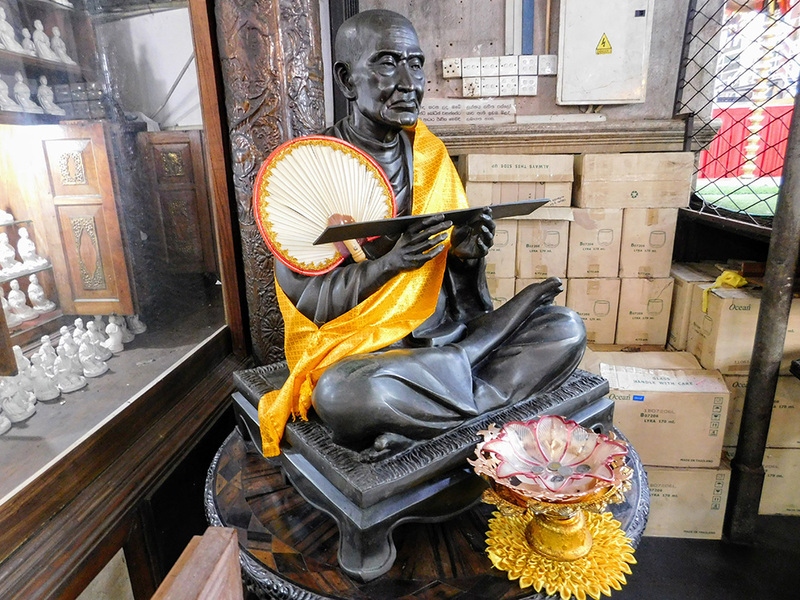 The Gangaramaya Temple also showcases a panoply of donated items, from furniture and copper bells to wristwatches and eyeglasses. Outside, check out an eight-ton Samadhi Buddha statue, made of white jade from Myanmar. Located in the city of Kandy in the central highlands of Sri Lanka, the Temple of the Tooth attracts more than a million visitors annually as a major Buddhist shrine. Originally constructed in 1595, it holds what’s reputedly the Buddha’s left canine tooth, preserved after his death and cremation in 543 BC in India. The octagonal Pathirippuwa pavilion, fronted by a moat, is dramatically lit at night. 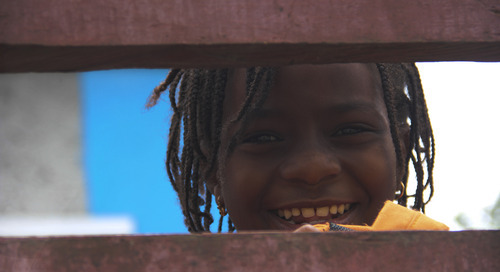 The tooth is ceremonially brought out in a golden case three times per day. Some believe that it grants the divine right to rule. It’s certainly interesting to observe the surging fervour that this relic inspires in the white-clad faithful. The Temple of the Tooth was damaged by bombing in 1998 during the 26-year Sri Lankan civil war. Today, the rhythms of turbaned drummers, who perform amid heavy incense and amplified chants, have replaced the sounds of war. As with other sacred Buddhist sites, ensure your arms and legs are adequately covered prior to visiting. Want to see the monuments of Sri Lanka for yourself? G Adventures can get you there. Check out our small group tours to Sri Lanka here.